NEW YORK, New York, June 12, 2013 (ENS) – Mayor Michael Bloomberg has offered a $20 billion dollar plan with more than 250 recommendations for making New York City more resilient to extreme weather resulting from climate change. The plan recommends installation of “integrated flood protection systems, measures like flood walls and levees” that can reduce the risk of flooding and can provide access to the waterfront for recreational, transportation and commercial uses at times storms are not threatening. Calling it “urgent work,” the mayor introduced his plan Tuesday, just 200 days before he leaves office after a 12 year stretch that saw Superstorm Sandy tear the city of 8.245 million residents apart last October. “This plan is incredibly ambitious – and much of the work will extend far beyond the next 200 days – but we refused to pass the responsibility for creating a plan onto the next administration. 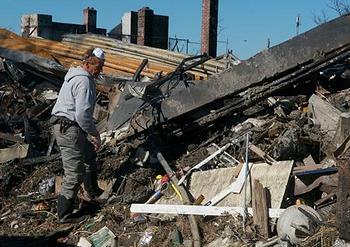 This is urgent work, and it must begin now,” the mayor said. 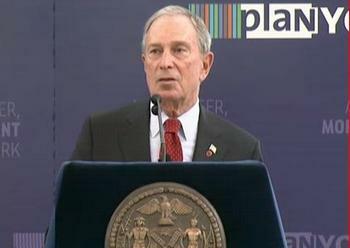 Bloomberg presented the plan to elected officials, business and community leaders and climate experts at the Duggal Greenhouse, which was damaged during Hurricane Sandy and has since reopened as one of the Brooklyn Navy Yard’s 330 businesses. In a first phase of the Bloomberg plan the City will work to install integrated flood protection systems in Hunts Point in the Bronx to protect the Food Distribution Center; on the East Harlem Waterfront along the Franklin D. Roosevelt East River Drive; at Hospital Row north of East 23rd Street in Manhattan; the Lower East Side; Chinatown; the Financial District; and in Red Hook in Brooklyn. The City will construct an extensive system of permanent levees, floodwalls and other protective measures along the East Shore of Staten Island – from Fort Wadsworth to Tottenville, including Midland Beach. The project will rise as high as 20 feet, protecting communities that were devastated by Superstorm Sandy and that have seen coastal flooding even during regular nor’easters for years. 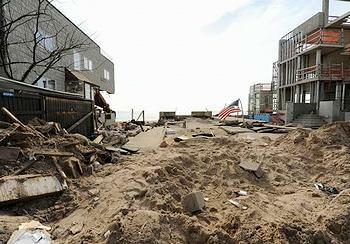 Also on Staten Island and on the hard-hit Rockaway Peninsula, the City will complete the construction of a dune system. The City will work with the U.S. Army Corps of Engineers to study and construct a dune project along the Rockaway Peninsula, starting with a double dune system at Breezy Point, where Sandy destroyed many homes, and also study a dune project for Coney Island. The plan calls for installing bulkheads of stone or concrete to hold shorelines in place, while protecting against sea-level rise and preventing erosion. The City will construct storm surge barriers, restore dune systems, replace sand and expand the beaches in Staten Island and Rockaway Peninsula, install offshore breakwaters in vulnerable areas and complete floodgate and tide gate repairs. Mayor Bloomberg even proposes building a new neighborhood to be known as Seaport City on a new multi-purpose levee with raised edge elevations. The is intended to both protect much of the East River shoreline south of the Brooklyn Bridge from inundation and create a new area for both residential and commercial development. Using the model of Battery Park City, which was designed to withstand major flooding, the City will work with local communities, businesses and property owners to explore opportunities for the new neighborhood. 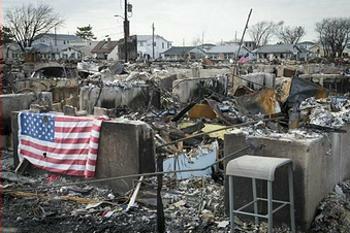 After Hurricane Sandy, the City assessed building damage data and found that, while small, light buildings built before 1961 – when the City updated its building codes – represented just 18 percent of buildings in the Sandy inundation zone, they comprised 73 percent of those destroyed or structurally compromised. In the case of most other buildings, damage was to critical building systems, such as electrical systems, elevators, boilers and drinking water systems; there were relatively fewer modern and larger buildings that experienced significant structural damage. The plan would designate $1.2 billion in loans or grants to building owners for flood resistance measures to improve the existing 68,000 buildings now in the 100-year floodplain through retrofitting and updating current regulations so that new construction meets higher standards. That figure includes: $100 million for one-to-three family homes; $500 million to be divided among the boroughs based on their share of buildings in the 100-year floodplain; and $100 million for affordable housing projects. The City will launch a sales tax abatement program for industrial businesses concentrated in coastal areas to subsidize the cost of making flood resiliency improvement. In the future, Bloomberg said, stronger storms and longer and more intense heat waves will pose to challenges to the city’s infrastructure and systems need to be upgraded. Fifty-three percent of New York City’s power plants are in the 100-year floodplain and by the 2050s, 97 percent will be; fuel suppliers are not required to harden supply lines, although many are in areas at risk of flooding or power outages; and significant gaps in telecommunications regulations have left cable TV, broadband, wireless and wired voice system networks exposed. The City will work with utility companies, regulators and climate scientists to analyze the risks and require plans that will update systems so that they can withstand events like Hurricane Sandy. The City will also work with suppliers and regulators to harden key power generators and electric transmission and distribution substations against flooding; strengthen overhead lines against winds; and protect the natural gas and steam systems against flooding. Bloomberg said the City will work with Con Edison to help it protect the Farragut substation, which serves nearly 1.25 million people and was nearly flooded during Hurricane Sandy due to its location on the Brooklyn waterfront. Hospitals in the 500-year floodplain must upgrade their facilities to higher standards the City will adopt. The City will make up to $50 million available to nursing home and adult care facilities to invest in protecting power, water, air conditioning and heating systems. The total cost of the more than 250 recommendations is nearly $20 billion – a sum that assumes each proposal is implemented along the suggested timeline. The City can rely on $10 billion provided through a combination of City capital funding already allocated and Federal relief, as well as $5 billion from additional, expected Federal relief already appropriated by Congress. To cover the remaining $4.5 billion gap, the City would look to additional Federal funding and City capital. Following Hurricane Sandy, Mayor Bloomberg re-convened the New York City Panel on Climate Change to update its projections and develop future coastal flood risk maps – all of which would inform the Special Initiative for Rebuilding and Resiliency. Cynthia Rosenzweig and Bill Solecki, the co-chairs of the City’s Panel on Climate Change, said Tuesday, “The inclusion of increasing risks due to climate change in the post Hurricane Sandy rebuilding of New York City is a positive tipping point for climate policy and action – not just for New York City, but for cities around the world. Sea levels could rise at a faster rate than forecast just four years ago – potentially by more than 2.5 feet by the 2050s. By the 2050s, the city could have three times as many days at or above 90 degrees – leading to heat waves that threaten public health and the power system, among other infrastructure systems. The analysis from the Special Initiative for Rebuilding and Resiliency shows that the costs of storms will increase: Sandy totaled $19 billion in damage and economic loss; in 2025, that cost grows to $35 billion and by 2055, $90 billion.